You Can Hear It Now! It was September 7, 1998. The infamous Labor Day Storm struck Syracuse, NY and the surrounding areas with massive damages everywhere. 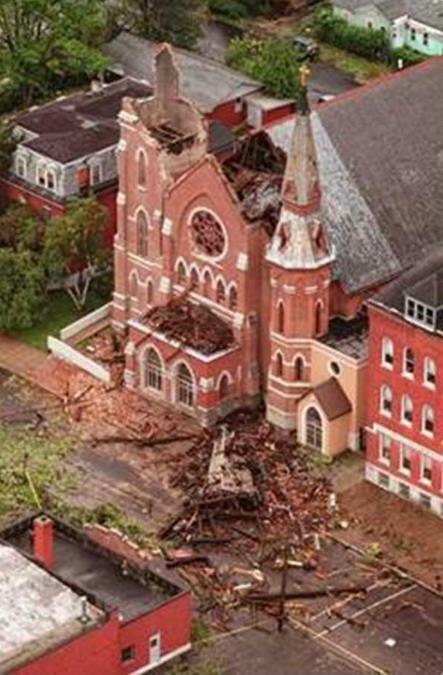 Probably the most noted damage was to the steeple that housed the bell at St. Lucy’s Church, 432 Gifford Street, Syracuse, NY. The storm sent the two-ton bell crashing through 2 floors of the church and ending up in the basement. Other than a thick coating of dust, the bell was unscathed. When Father Jim Mathews checked out the bell, he discovered an inscription on it that read “Resurexit Alleluia,” which translates to “Resurrection Hallelujah”. The bell has spent most of the last 15 years in the courtyard between the church and the school waiting for this day to be “resurrected”. With the help of many volunteers and businesses in the community, the bell is now displayed on a special frame that is attached to a concrete base in front of the church. It was ironic that a storm brought it down and it was storming the day it was set into position in its new home. Mack Brothers did a beautiful job on restoring the bell to its original glory. 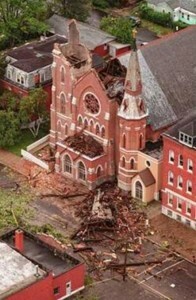 This picture from the Syracuse.com archives/David Lassman, shows the damaged steeple. If you direct your eyes from the missing steeple down to the ground, you will see two white sections framing the corner of the church. These were concrete walls that have been replaced by metal railing and the bell now resides inside this area. The bell completes St. Lucy’s and St. Lucy’s compliments the bell. 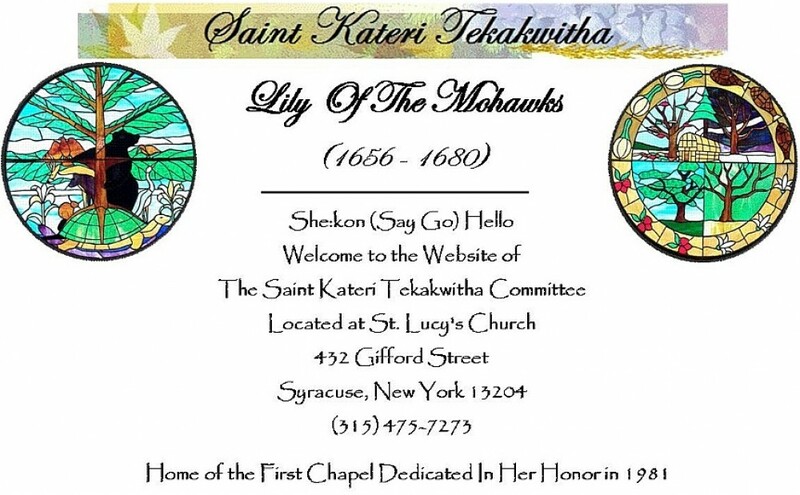 Father Jim Mathews is planning a dedication Mass and ceremony in the very near future. We have our bell, all is well.